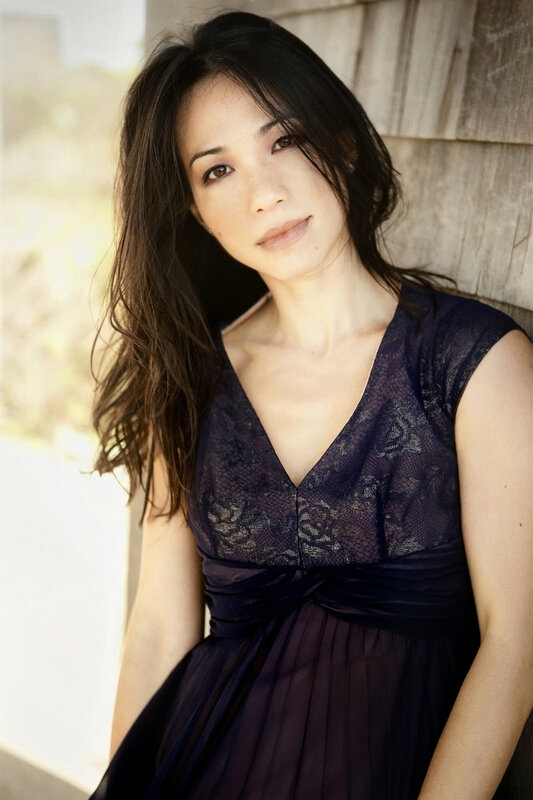 Tune in and listen to Quynh's live interview about her life and music on Voice America. April 16, 2018International Keyboard Institute and FestivalQuynh will be performing and conducting master classes at the Internatioanal Keyboard Institute and Festival in New York City from July 14 and July 28. April 11, 2018Stars of Steinway SeriesQuynh has been invited to perform a program of solo performance and the Chopin First Concerto in E minor at the "Stars of Steinway Series" in Boise on November 11, 2018. 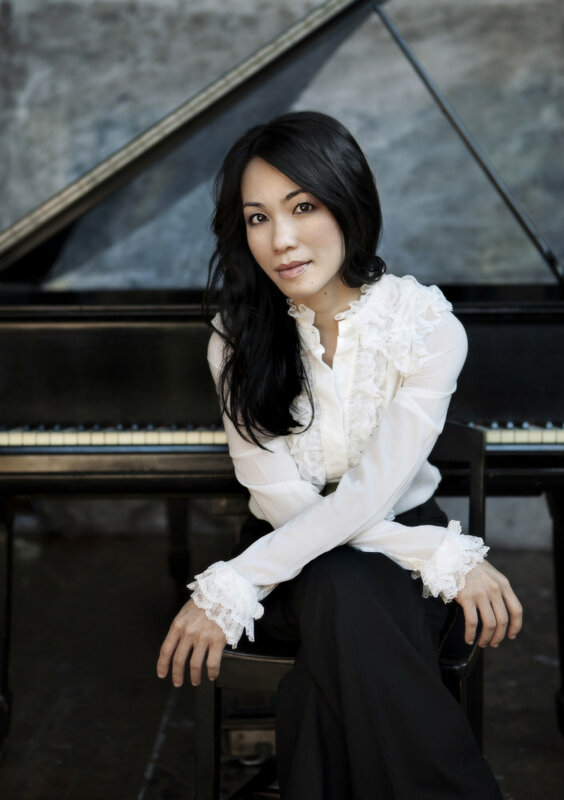 March 7, 2018Second Prize winner of The American Prize for both solo and concerto with orchestraQuynh Nguyen received a Second Prize in The American Prize Lorin Hollander Award for her performance of the Mozart Concerto K. 453 with the JagerMeister Orchestra, as well as the Second Prize in the Solo Piano Professional Division of The American Prize competitions in 2018. July 5, 2016International Keyboard Institute and FestivalQuynh will be performing the G Major Mozart concerto K. 453 with the Jäger Meisters Chamber Orchestra, conducted by Eduard Zilberkant , at the Kaye Playhouse in New York City , as part of the International Keyboard Institute and Festival in NYC in July of 2016. She will also be conducting master classes at the festival from July 17 to July 31. 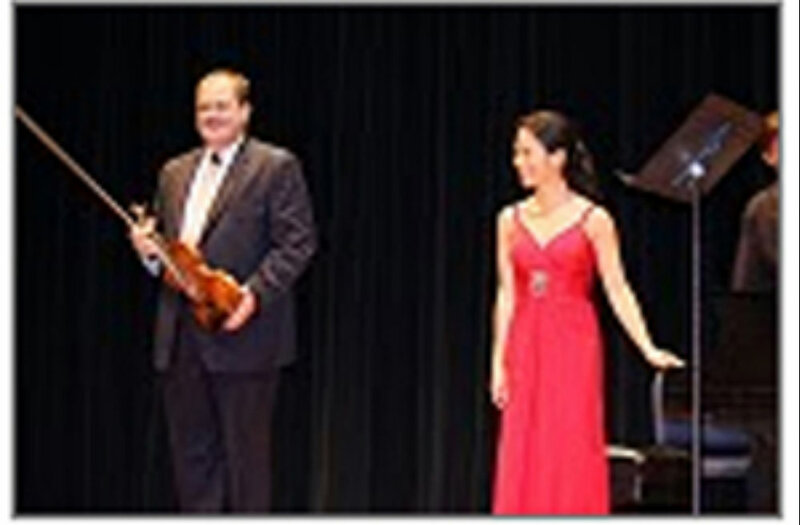 March 3, 2015Sun Valley Artist SeriesQuynh performed both solo and concerto concerts at the International Piano Festival at the Sun Valley Artist Series on April 22-25 of 2015 to enthusiastic audiences. January 22, 2015New CDLive In New York CD on the Arabesque label is now available on Amazon and iTunes. Her playing of Ravel's ''Tombeau de Couperin'' was marvelous: she excels in everything that requires elegance, proportion, balance, taste, and wit. "Her delightful Weill Hall recital offered renditions of Bach's G-minor English Suite (with a witty suggestion of a tambourine in the Gavotte), Schubert's D-major Sonata, D. 850, and vernal, lyrical accounts of Chopin's E-major Scherzo and late E-flat Nocturne (Op. 55, No. 2). Likewise memorable was her fleet, crystalline Ravel Tombeau de Couperin at a later Merkin Hall concert." Rarely does one hear a young artist with such a naturally flowing sense of melodic line - vivid and unforced - that permits the music to breath uninhibited. This flexible way of playing allows poetry and emotion to expand organically. Quynh Nguyen is already a major talent of the younger generation of keyboard artists. 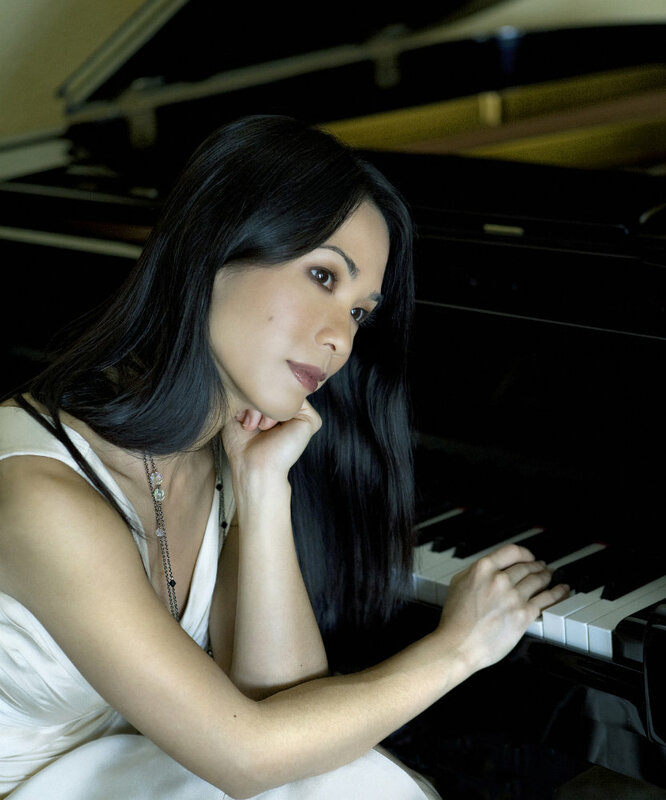 Ms. Nguyen's pianism and music making are graced with beauty and exuberance. She is a real artist; a wonderfully communicative performer. What a compendium of intellect, sophistication and taste! She is often sensitive and poetic, ... she knows how to make (the music) dazzle with lively rhythm, piquant inflexions, and dashing virtuosity. 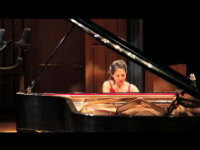 She captures impressive and splendid characterization of musical creation through intensive animation and flexibility. With filigree technique, she charms everyone present with her music. . . [and] the listeners gave this musical romantic a wonderful reception. 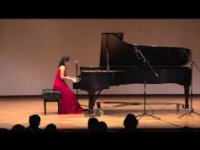 This pianist understands and has mastered the dramatic, lyrical and introvert nuances in Chopin compositions, and for this she received the biggest applause. She demonstrates in her performances a unique combination of virtuosity, poetry and passion. It is always a joy to be in the audience when she performs . . .
Messiaen: Great feel, colors, phrasing all good. Excellent playing. Chopin: Very beautiful. She is gifted with a tender musicality, allied with a dazzlingly deft balance between the hands thatmake her performances of Schubert and Chopin, as heard on this new disc, irresistible. "[On] Saturday night, she made her local debut, and it was easy to understand why even people who are hard to please like her so much. She is a musical and expressive player who commands a flexible, singing sound. She is often sensitive and poetic, and when she should dazzle with lively rhythm, piquant inflexions, and dashing virtuosity -- as in Chopin's ''Andante spianato and Grand Polonaise brillante,'' or in the Chopin waltz she offered as an effervescent encore -- she knows how to. 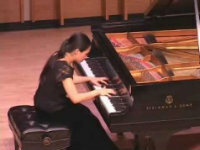 Quynh opened with an unusual Sonata in F Minor by Muzio Clementi, which she played in an operatic and romantic style. Her playing of Ravel's ''Tombeau de Couperin'' was marvelous: she excels in everything that requires elegance, proportion, balance, taste, and wit...Schumann's ''Kreisleriana'' was almost too beautifully played, with subtle interplay of inner voices... "
. 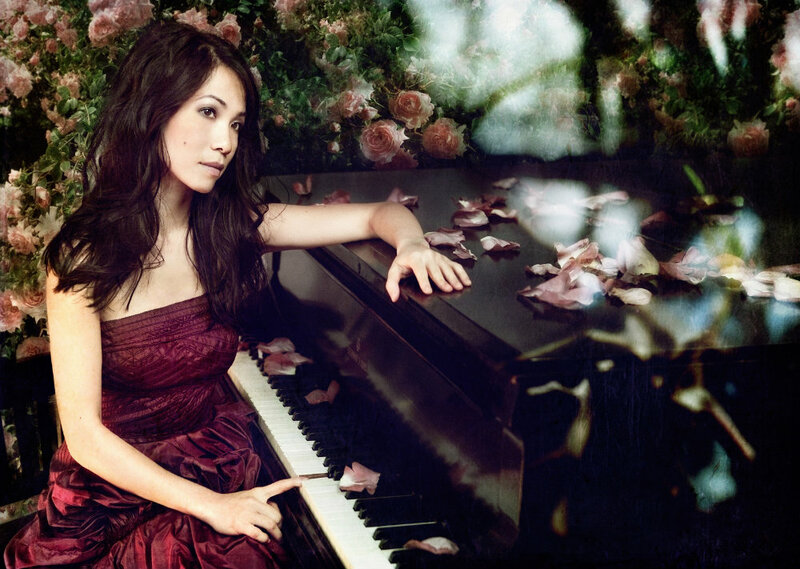 . . her pianistic ability is beyond question; proven by her many concerts, reviews and recordings. She demonstrates in her performances a unique combination of virtuosity, poetry and passion. It is always a joy to be in the audience when she performs . . . [She is] a brilliant pianist . . . she has worked with me as well asBella Davidovich and is a truly wonderful artist . . . she is extraordinary in every way . 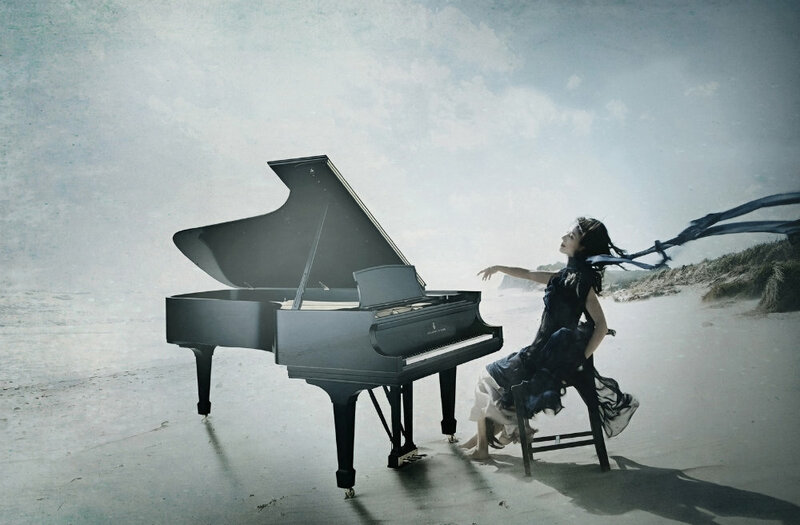 . . there is a loveliness and strength to her playing and true qualities that make her a superb performer of Chopin. 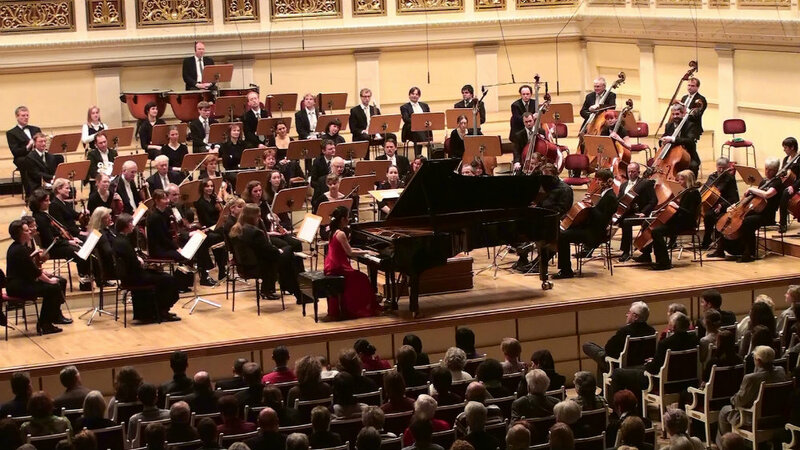 The Hanoi, Vietnam-born pianist Quynh Nguyen, now an American citizen, was born in 1976 and studied at the Juilliard School and Mannes College of Music, after debuts in Hanoi and some early training at the Gnessin Institute in Moscow, studying with Oleg Musorin. 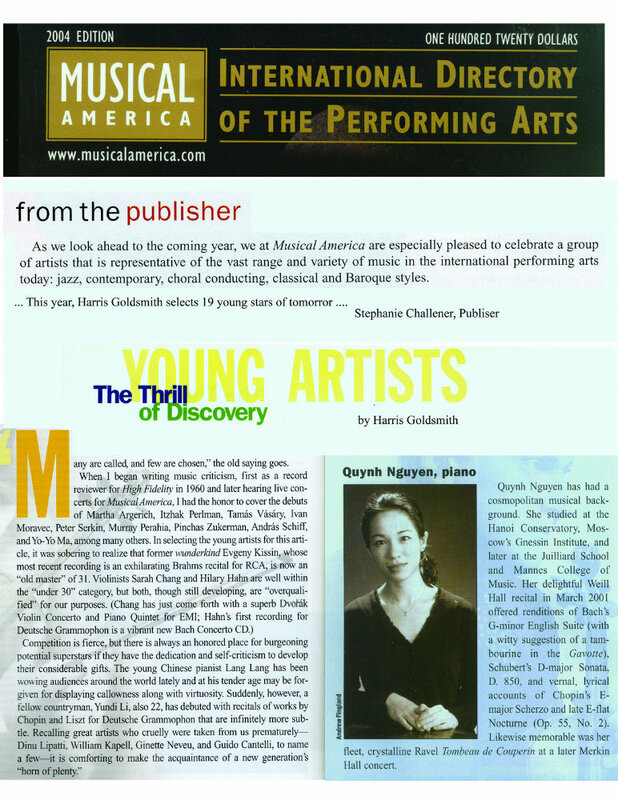 In New York her teachers have included Martin Canin, Jerome Rose, Jacob Lateiner, Bella Davidovich, and Robert Turner. 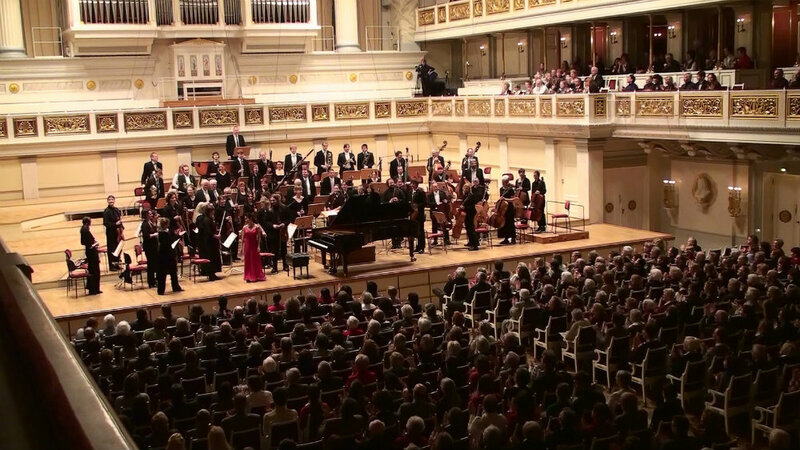 She has concertised in Hungary, Germany, Switzerland, Austria and the United States. She is gifted with a tender musicality, allied with a dazzlingly deft balance between the hands that make her performances of Schubert and Chopin, as heard on this new disc, irresistible. In Chopin's Nocturne in E flat, her trills have a poignancy that is entirely suited to the music, while she expresses the joyous dash needed for the same composer's showpiece: the Andante Spianato and Grand Polonaise. 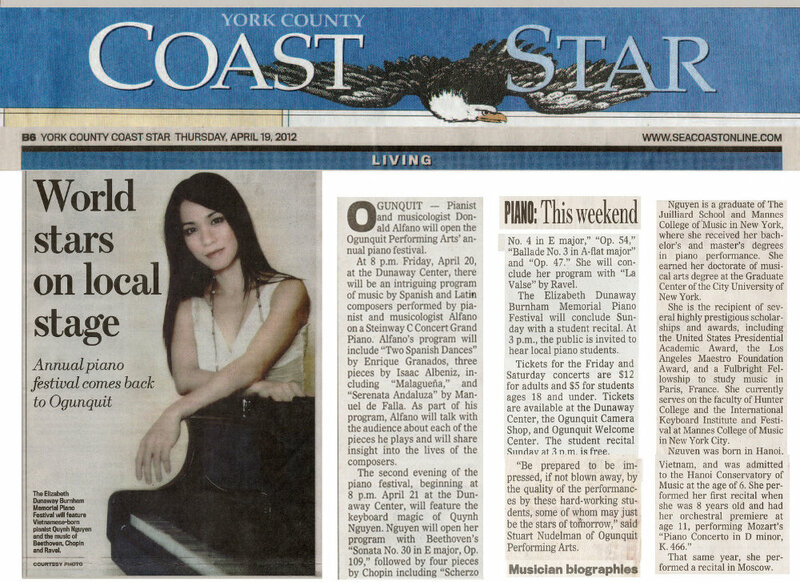 When Nguyen made her New York recital debut last year at Weill Hall, she was greeted by a rave notice from the usually judicious keyboard connoisseur Harris Goldsmith, who exclaimed, 'Ms. 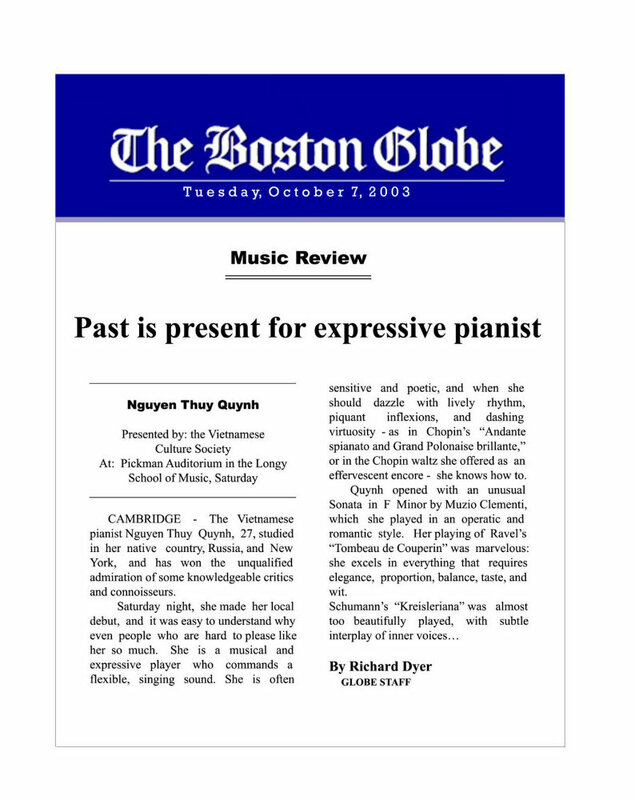 Nguyen's pianism and music-making are graced with beauty and exuberance. She is a real artist; a wonderfully communicative performer obviously intoxicated with the joy of living her music and sharing it with those lucky enough to hear it spring from her soul. What a compendium of intellect, sophistication and taste! True enough, Nguyen's Schubert is fresh and fleet, with a kind of poetic approach allied with digital dexterity in the tradition of the late Russian virtuoso Yuri Egorov, although more pliant and endearing than the splashy Egorov generally sounded... Rarely does one hear a young artist with such a naturally flowing sense of melodic line - vivid and unforced - that permits the music to breath uninhibited. This flexible way of playing allows poetry and emotion to expand organically. Quynh Nguyen is already a major talent of the younger generation of keyboard artists, to be placed alongside Klara Wurtz and Irina Rees. 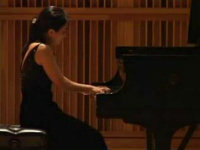 This young pianist, born in Vietnam and trained in Russia as well as in the United States, received high praise from reliable quarters for her New York debut recital last year. Now she offers an interesting and well-varied program of Clementi (Sonata Op. 13 No. 6), Schumann ("Kreislariana"), Ravel ("Le Tombeau de Couperin") and Corigliano ("Fantasia on an Ostinato"). Tomorrow at 8:30 p.m., Merkin Concert Hall, 129 West 67th Street, Manhattan, (212) 501-3330. 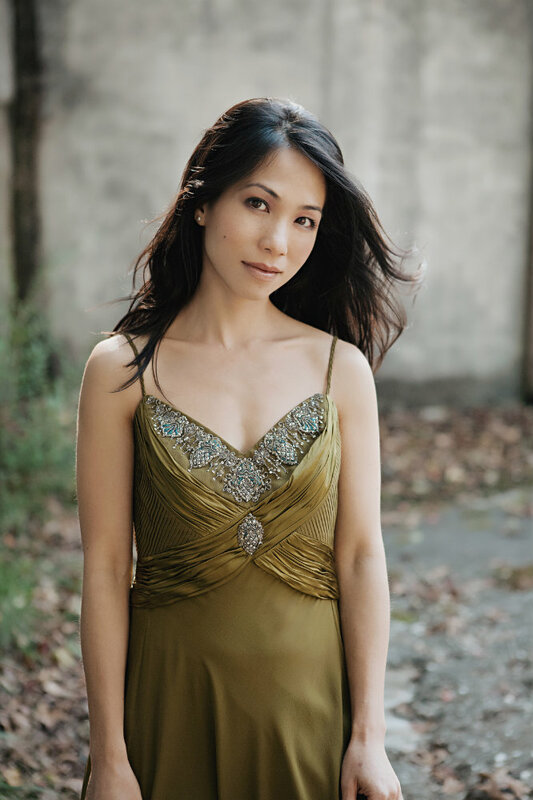 A New York debut of exceptional distinction was played by pianist Quynh Nguyen on March 3rd at Weill Hall as part of Artists International’s Debut Winners Series. 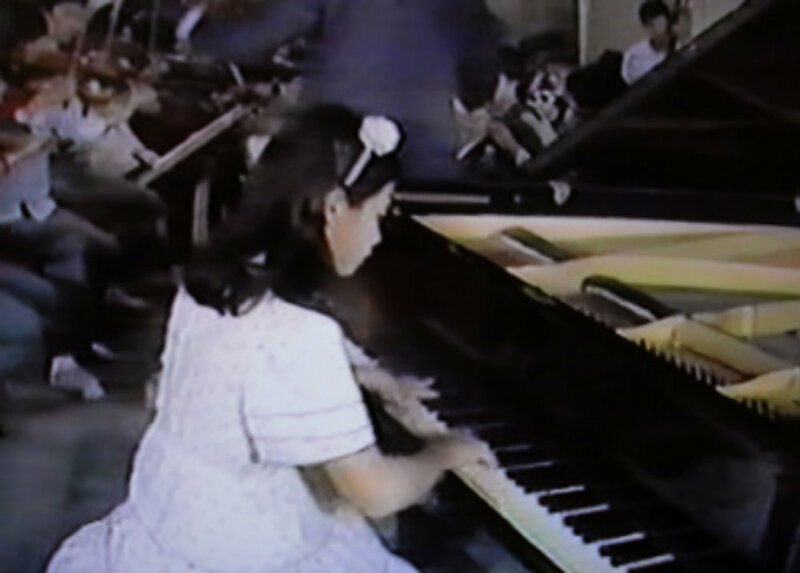 Ms. Nguyen, who was born in Vietnam to a family of musicians, played her first recital at the age of nine, and at eleven made her orchestral debut performing Mozart’s Concerto No. 20 in D minor, K. 466. 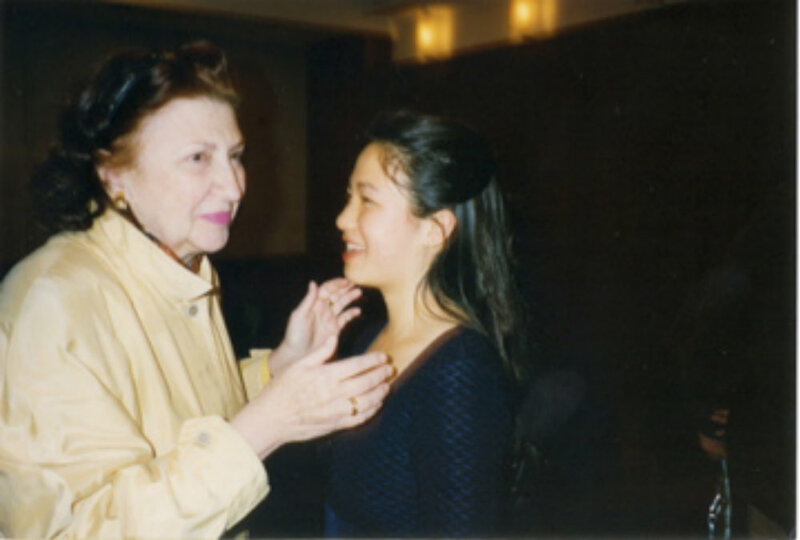 That same year she gave a recital in Moscow, and at 13, received a full scholarship to study at the Gnessin Institute in Moscow. 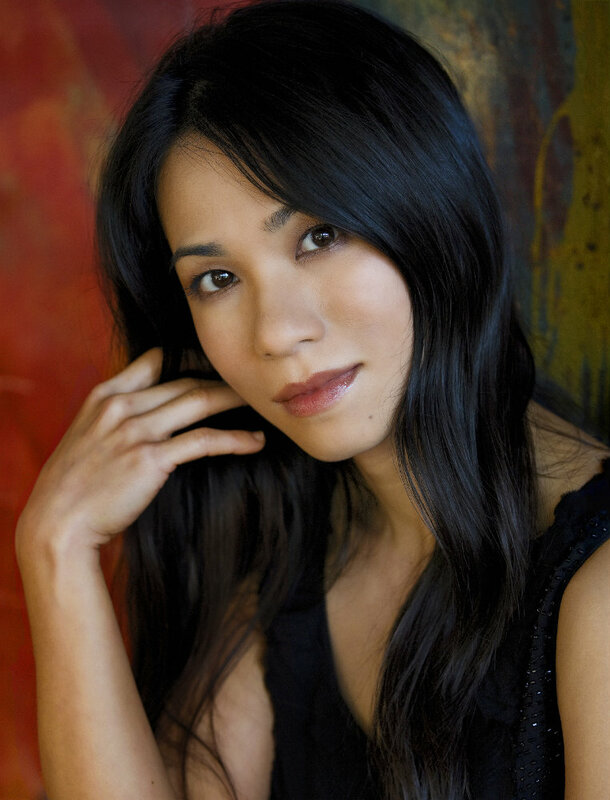 She continued her studies as a scholarship student at the Juilliard School and at the Mannes College of Music, where she received her Bachelor’s and Master’s degrees respectively. She is currently enrolled in the DMA program at CUNY. Her teachers include Oleg Mussorin, Robert Turner, Bella Davidovich, Alexander Paley, Jacob Lateiner and Jerome Rose. And, as her bio for the recital adds, “she has performed in master classes given by Tatiana Nicoleiva, Garrick Ohlsson, Bryce Morrison, Pavlina Dokovska, Peter Frankel, Richard Goode, and András Schiff”. 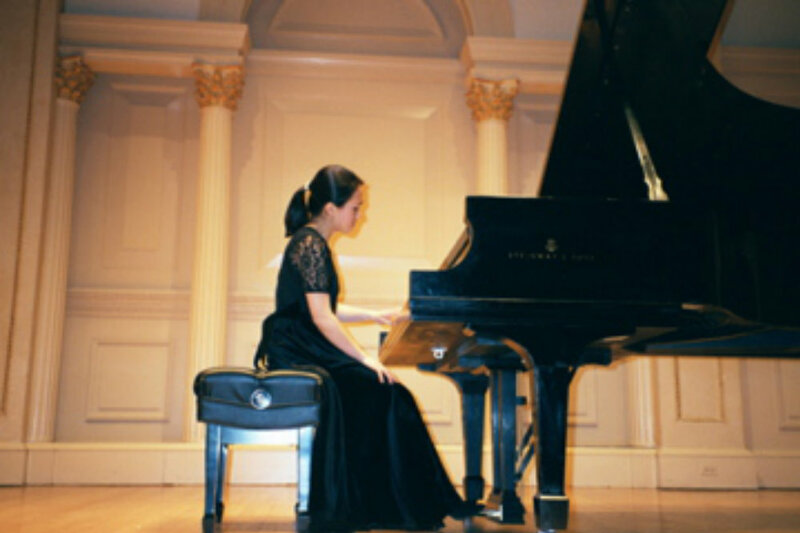 Ms. Nguyen’s credentials are indeed impressive, and little wonder that she has distinguished herself in various piano competitions and gained extensive concert experience worldwide—in Hungary, Germany, Switzerland, Austria, and the United States. But even my fondest hopes and expectations were gloriously sustained and surpassed by this dream of a recital. 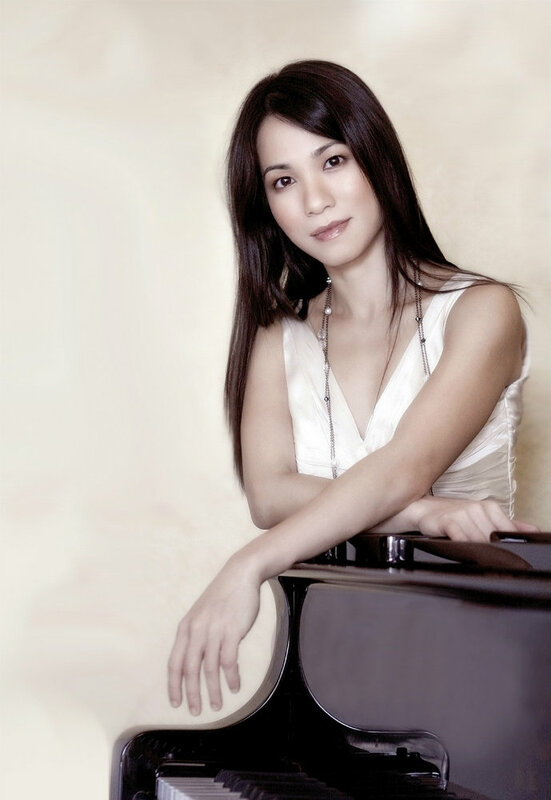 Ms. Nguyen’s pianism and music making are graced with beauty and exuberance. She is a real artist; a wonderfully communicative performer obviously intoxicated with the joy of living her music and sharing it with those lucky enough to hear it spring from her soul. What a compendium of intellect, sophistication and taste! And she is also (in her unobtrusive way) an accomplished virtuoso, equipped to dispatch even some of the most difficult and subtle compositions on her program (J.S. Bach’s English Suite in G minor BWV 808, Schubert’s Sonata in D major, Op. 53, D. 850; and three of Chopin’s most rarified masterworks, his Scherzo No. 4 in E major, Op. 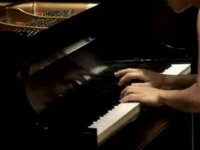 54; his late Nocturne in E flat major, Op. 55 No. 2; and earlier but demanding Andante Spianato and Grande Polonaise, Op. 22). The Bach Suite took wing with infectious brio. Her propulsive way with the opening Preludium may have initially seemed too dangerously precipitate but the rhythmic control was secure and admirable steady. The ensuing Allemande, Courante, Sarabande, Gavotte and Gigue all likewise shared that same lustrous singing tone. The Sarabande was especially modest and eloquent, and she brought a delightful sense of humor to her fleet delivery of the Gavotte (with the tambourine-like repeated bass notes in its second strain deliciously and tastefully emphasized; and the almost Schumannesque maggiore central Trio poignantly savored). The first movement of the Schubert Sonata took wing at an almost wicked clip. Here, if there is any room for reservation, Ms. Nguyen might have allowed for just a hairbreadth more tonal solidity and breathing space to make the most of this extremely Beethovenian writing. But, no matter, the potentially quirky crossing of hands and such were admirably under rhythmic control (no Schnabel-like desperation this time!). And how Ms. Nguyen’s spot-on sense of color and timing kept the potentially repetitious Con moto second movement airborne. (All of the myriad variations of filigree were splendidly creative and engaging and never once did interest flag). For once, there were no “editorializing” of rhythm in the Allegro vivace Scherzo (again that “Tradition” established almost reflexively by that famous old Schanbel recording), and in retrospect it was a pleasant and unpretentious departure from precedent. The Rondo: Allegro moderato, taken a bit more rapidly than usual, delectably recreated the nursery-rhyme “Sing a Song of Six Pence” quality in this fleet and lovely version. And so it was with the Chopin group heard after intermission: the Fourth Scherzo had an almost Mendelssohn-like gossamer quality. Filigree was impishly tossed off, the octaves sonorously in place, and the central Trio section again achieved without fuss or contortion. The Nocturne was, if anything, even better: the absolute highpoint of the afternoon: I have never heard it played more eloquently, by Ignaz Friedman, Perahia, Horowitz, Rubinstein—or anyone whose interpretations linger in the mind’s ear. (Yes, this performance was truly sublime.) The Andante Spianato had a classical simplicity and proportion, and the following Grande Polonaise—a brilliance and swagger—with some effective left hand anticipations and octave amplifications making the proceedings all the more stylish and effective. We will, no doubt, be regularly hearing much more from Quynh Nguyen: Remember her name! She was my student at The Juilliard School for four years during which time she showed herself to be a wonderful young artist. She has impressive technical and musical assets, along with discipline and desire to develop herself. She made wonderful progress while studying with me and I look forward to watching her life as professional pianist evolve. Berlin Konzerthause. Conductor: Kristiina Poska. 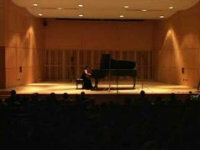 The International Keyboard Institute and Festival in New York City. 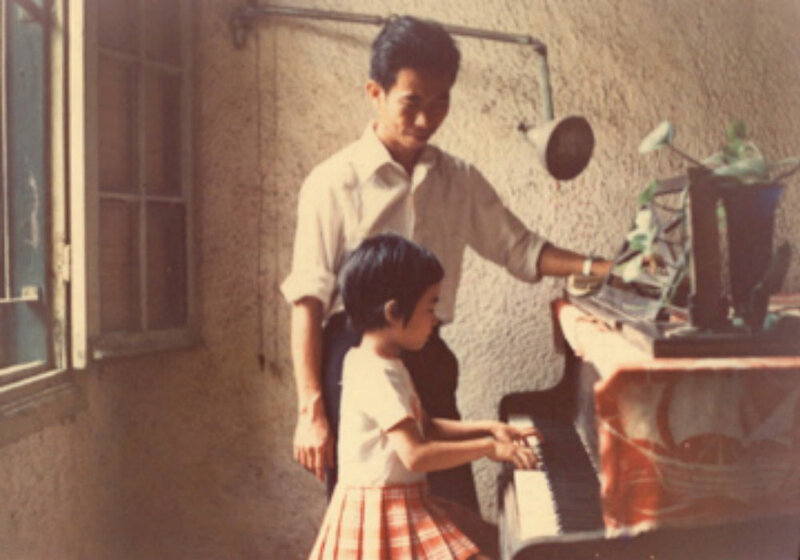 Née au Vietnam, Quynh Nguyen a commencé le piano à l’âge de quatre ans. Elle a donné son premier récital quand elle avait neuf ans, et a effectué son début orchestral à onze ans, interprétant le Concerto pour piano de Mozart en ré mineur, K. 466. Elle a aussi donné un récital cette même année à Moscou. A l’âge de 13 ans, elle bénéficia d’une bourse pour étudier le piano avec Oleg Musorin à l’Institut Gnessin de Moscou. 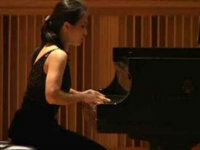 Ancienne boursière à la Julliard School et au Mannes College of Music, Mlle Nguyen est actuellement candidate pour un doctorat en musique au Graduate Center de la City University de New York. Parmi ses professeurs on peut compter Martin Canin, Jerôme Rose, Jacob Lateiner, Bella Davidovitch, Robert Turner et Ton That Triem. Elle a joué lors des cours donnés par les maîtres Tatiana Nicolieva, Garrick Ohlsson, Bryce Morrison, Jeffrey Siegel, Jeffrey Swann, Victor Rosenbaum, Pavlina Dokovska, Peter Frankl, Richard Goode et Andras Schiff. 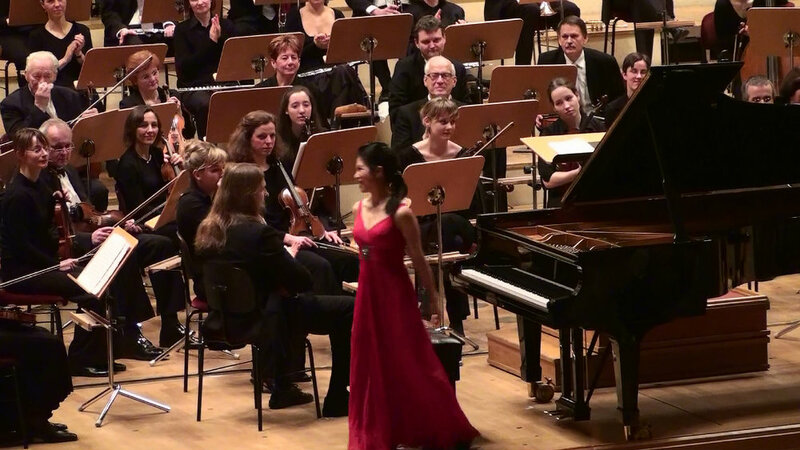 Mademoiselle Nguyen a remporté des prix prestigieux de plusieur national et international piano competitions et elle a acquis une grande expérience de concert partout dans le monde – en Hongrie, en Allemagne, en Suisse, en Autriche, en France et aux Etats-Unis. Elle a souvent été programmée dans les stations de radio suivantes: WQXR à New York, North Indianapolis Public Radio, section musique classique, WHRO-FM, en Virginie, 89.9 WDAV Classical Public Radio, en Caroline du Nord et Classical 94.5 WNEDFM à New York. Elle est passée à l’émission télévisée “ Grand Piano” à Los Altos en Californie et aussi à la télévision japonaise et vietnamienne. 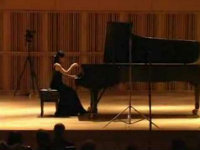 Mademoiselle Nguyen a été invitée à joindre la faculté du International Keyboard Institute & Festival à New York City et la faculté du Music Department of Hunter College, City University of New York. “ Je vous ai entendu jouer avec grand plaisir et je trouve que vous êtes une excellente pianiste ! “ … Sa maîtrise du piano est incontestable, corroborée par ses nombreux concerts, la critique et les enregistrements. Elle fait preuve, lors de ses concerts, d’une combinaison unique de virtuosité de poésie et de passion. C’est toujours une grande joie d’être parmi le public quand elle joue… C’est une pianiste brillante… Elle a travaillé avec moi tout comme avec Bella Davidovich et elle est véritablement une artiste fabuleuse…Elle excelle en tout… Il y a une beauté et une force telles dans son jeu qu’elle détient toutes les qualités pour faire d’elle une superbe interprète de Chopin. 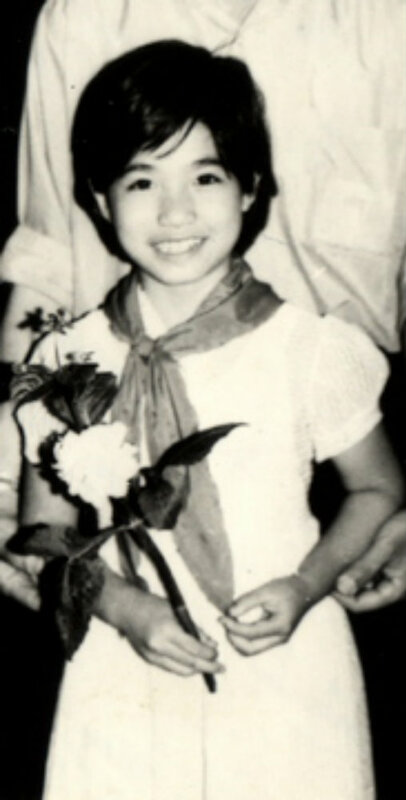 Née en 1976 à Hanoï et d’origine vietnamienne, naturalisée américaine, la pianiste Quynh Nguyen a étudié à la Juillard School and Mannes College of Music après ses débuts à Hanoï et une formation antérieure à l’Institut Gnessin de Moscou avec Oleg Musorin comme professeur. A New York elle a compté parmi ses professeurs Martin Canin, Jerôme Rose, Jacob Lateiner, Bella Davidovitch et Robert Turner. Elle a donné des concerts en Hongrie, en Allemagne, en Suisse, en Autriche et aux États-Unis. Douée d’une tendre musicalité et d’un prodigieux équilibre entre les deux mains, elle interprète d’une manière irrésistible Schubert et Chopin dans son nouveau CD.Dans son interprétation du Nocturne de Chopin en fa bémol, ses trilles renferment une emotion tout à la hauteur de la musique, alors qu’elle exprime si bien les envolées joyeuses nécessaires dans l’Andante Spianato et La Grande Polonaise du même compositeur. quoique plus souple et plus attachante que dans la manière de jouer quelque peu tape-à-l’oeil de ce dernier. Quatrième de Beethoven (elle pourrait tout aussi bien y inclure la Troisième) et les concertos de Schumann et de Chopin. Il serait intéressant de l’entendre jouer Mozart et Mendelssohn. On rencontre rarement une jeune artiste avec un tel sens de la mélodie, avec un tel naturel, une manière de jouer si vivante et coulée, permettant à la musique de respirer librement. Cette souplesse dans l’interprétation donne libre cours à la poésie et à l’émotion. 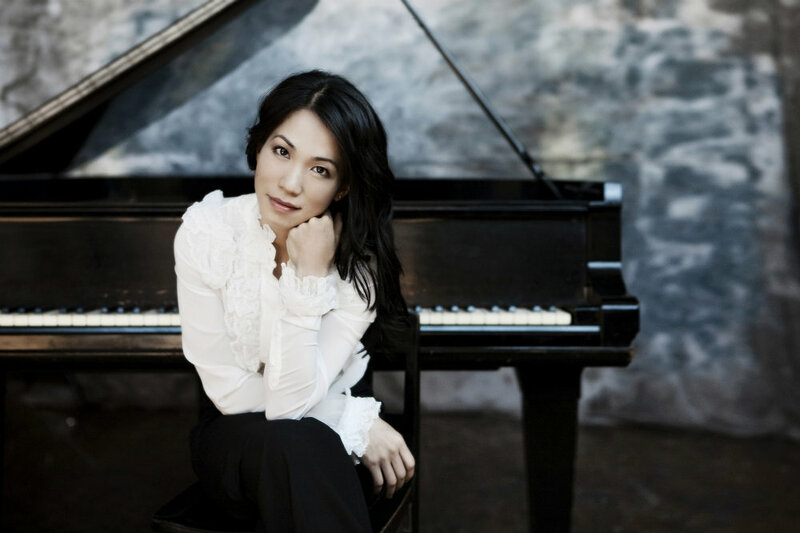 Quynh Nguyen est déjà une pianiste de grand talent dans la lignée de Klara Wurtz et d’ Irina Rees. “ Prenons la pianiste vietnamienne-américaine Quynh Nguyen. L’année dernière, elle a donné son premier récital à New York donnant suite à un compte rendu rare donné par le doyen des critiques du piano aux États- Unis, Harris Goldsmith. 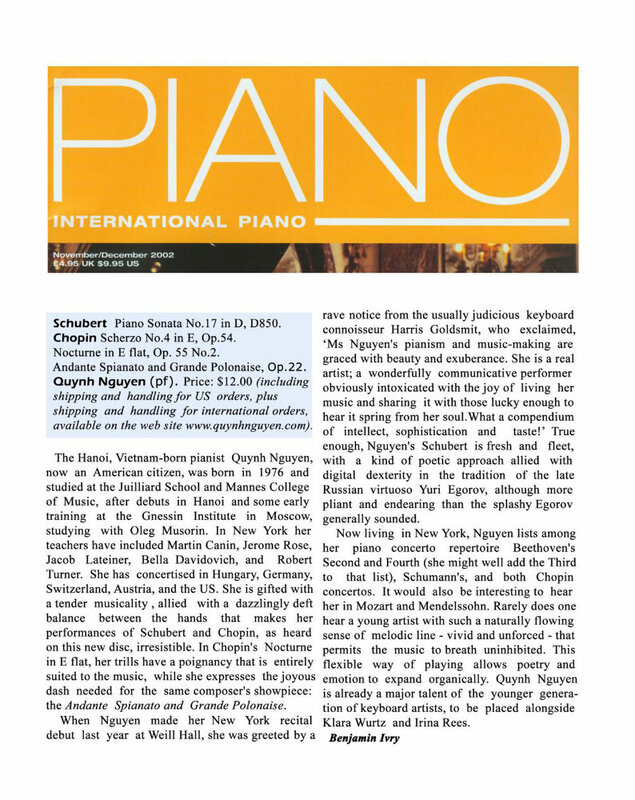 Ce dernier a applaudi l’interprétation de Chopin de Mlle Nguyen en affirmant qu’elle jouait avec plus d’éloquence que les grands maîtres du piano comme “ Ignaz Friedman, Perahia, Horowiz, Rubinstein ou qui que soit d’autre dont les interprétations demeurent présentes à l’esprit. Ce type de réaction aurait garanti, en d’autres temps, un contrat d’enregistrement, d’autant qu’elle est jeune et photogénique. Au contraire, elle a dû payer elle- même pour ses deux CDs qui sont disponibles sur son site internet. ( “ Fantasia sur un Ostinato ”). Demain à 20h 30, au Martin Concert Hall, 129 West 67th Street, Manhattan, (212) 501-3330. Goode et András Schiff ”. Les références de Mademoiselle Nguyen sont résolument impressionnantes et il n’est point étonnant qu’elle se soit distinguée dans de nombreux concours de piano et qu’elle ait acquis une telle expérience de concert dans le monde entier : Hongrie, Allemagne, Autriche et aux États-Unis. rares de Chopin, son Scherzo No. 4 en mi majeur, Op. 54, son dernier Nocturne en fa bémol majeur, Op. 55 No 2 et son plus récent mais difficile Andante Spianato et Grande Polonaise, Op. 22). main gauche irréprochable et des sonorities d’octaves rendant l’ensemble d’autant plus élégant et efficace. Quynh Nguyen fera sans nul doute encore plus parler d’elle . C’est un nom que l’on n’oubliera pas de sitôt. “ Quelle soirée fantastique !… Nourissant l’âme et l’esprit ! Je me sens inspiré et fougueux. Nghệ sỹ Piano Nguyễn Thúy Quỳnh được Musical America bình chọn là một trong “19 ngôi sao của ngày mai”. Báo Boston Globe ngợi ca cô như “một nghệ sỹ giàu chất thơ ca, âm nhạc, tinh tế và biểu cảm”. 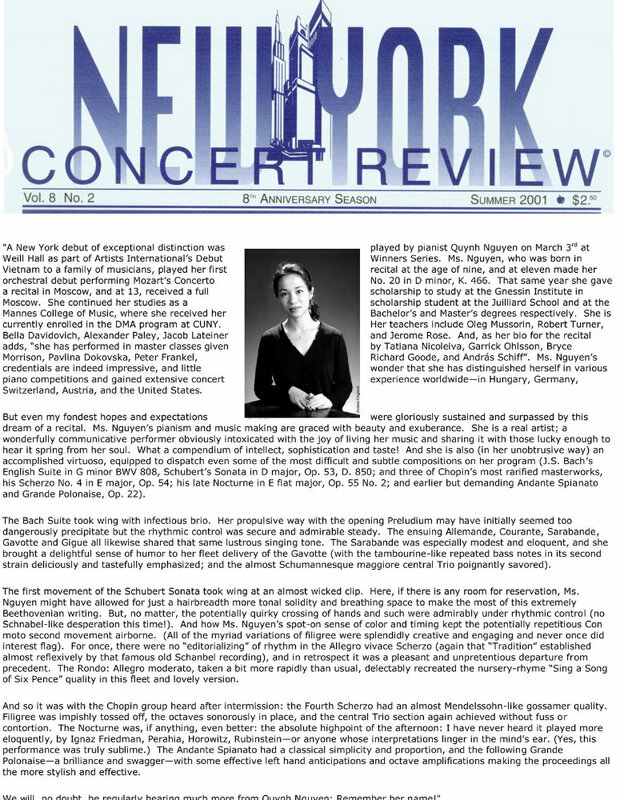 Về những chương trình biểu diễn của cô tại Carnegie Hall, tạp chí the New York Concert Review bình luận: “Cô là một nghệ sỹ thực thụ, một người biểu diễn có sức truyền cảm tới khán thính giả, một sự tổ hợp tuyệt vời của trí tuệ, tinh tế và thẩm mỹ”. Thúy Quỳnh thường xuyên trình diễn trên toàn nước Mỹ và một số quốc gia Châu Âu như Hungary, Đức, Thụy sỹ, Áo và Pháp, tại các phòng hòa nhạc nổi tiếng như Weill Recital Hall tại Carnegie Hall, Avery Fisher Hall, Lincoln Center, McEvoy Auditorium và the Freer Gallery tại the Smithsonian, Washington D.C., và the Berlin Konzerthause. 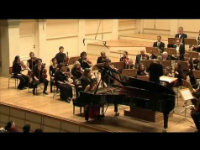 Là nghệ sỹ độc tấu công-xec-tô viết cho piano, cô trình diễn cùng dàn nhạc của ĐH Berlin University Orchestra, the San Francisco Concerto Orchestra, the Bellflower Orchestra, the Brentwood-Westwood Symphony Orchestra, dàn nhạc Giao hưởng Hà Nội, và the Regional Wind Orchestra of Paris. Thúy Quỳnh giành được nhiều giải thưởng cao trong nhiều cuộc thi piano như the Artist International Presentation Competition, the Bellflower Orchestra Competition, the Artists of Tomorrow Competition of the Brentwood-Westwood Symphony Orchestra, và the International Piano Concerto Competition tại San Francisco. Ngoài ra, chương trình biểu diễn của cô được phát sóng trên nhiều radio có uy tín tại Hoa Kì và một số chương trình truyền hình như Wayne Picciano’s award-winning “Grand Piano”, CUNY TV channel 75 trong chương trình “Study With the Best,” Đài Truyền hình Nhật Bản Fujisankei và Đài Truyền hình Việt Nam. 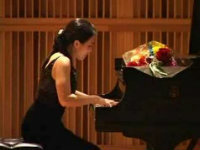 Thúy Quỳnh tốt nghiệp trường The Juilliard School và Mannes College of Music, nơi cô theo học Bella Davidovich và Jerome Rose. Cô giành được học vị Tiến sỹ về Âm nhạc Graduate Center of City University of New York vào năm 2009. Cô đã trình diễn trong các lớp học do các nghệ sỹ nổi tiếng thế giới giảng dạy như Tatiana Nikolaeva, Richard Goode, Jeffrey Swann và Andras Schiff. Cô được nhận học bổng Barry Brook Dissertation của Graduate Center để hoàn thành luận án Tiến sỹ với đề tài “Phân tích tác phẩm cuối cùng độc tấu pinao của Olivier Messiaen: Les Petites Esquisses d’oiseaux”. Ngoài ra, Thúy Quỳnh còn được nhận nhiều học bổng danh giá như “the United States Presidential Academic Excellence Award” và học bổng Fulbright để sang học tại Paris, Pháp. Hiện nay, Thúy Quỳnh là giảng viên của Hunter College và the International Keyboard Institute and Festival tại New York City.